There is much to say about the history of mankind and of the Earth. On one hand, there are controversial views that range from extraterrestrial influences defended by Erich von Daniken and Sitchin to literal interpretations of the Bible that reduce the history of the Earth to a few thousand years. On the other hand, we have the Orthodox scientists, who rely on archaeological and geological research, but do not realize that they might base their research on the wrong assumptions: assumptions that Darwinism is true, everything goes from primitive to advanced, and the Earth already has had the same mass, volume and orbital period around the Sun for millions of years. Until I came in contact with Jesus Gamarra, the son of the late Alfredo Gamarra, I had not realized myself how far off current science might be. Jesus showed me phenomena in the ruins in and around Cusco, Peru. The official view is that everything in the ruins was created by the Inca. There are stunning buildings, made with great precision and often gigantic dimensions, in fantastic beautiful locations. One who sees these ruins for the first time is impressed by them, as I was. One thinks, this is very cleverly done by the Inca, but most will think that there is not much more to say about those old stones. However, fate willed that I moved to live in Cusco. Because of daily contact with the ruins, such as the famous perfect fitting walls, and by working together with Jesus Gamarra, I began to see things in a new light. One stone is not the same as the others. Jesus told me about the precision, the giant dimensions, the different styles, the phenomenon of 'vitrification', etc.. All of this is repeated in other ruins, in the same way and in the same order, from Cusco to Sacsayhuaman, from the Sacred Valley of the Inca to Machu Picchu. Eventually, it is repeated on the global level; we can see the same phenomena in Egypt. 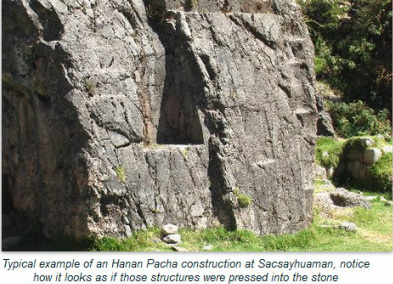 The point is that we see things, but we do not know how they were made, when they were made, or by whom they were made, an observation that Erich von Daniken also made when he saw Sacsayhuaman for the first time. For him, there were enough reasons to relate all of what he saw to alien intervention. 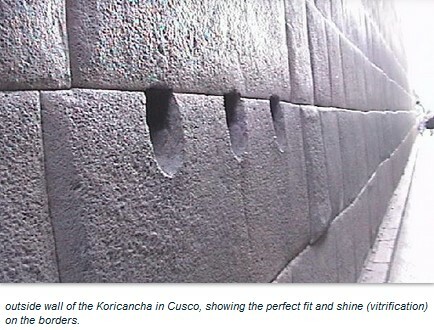 A popular viewpoint is that the Inca could soften the stone with the help of plant extracts. This seems to me impossible to achieve because of the scale of all the phenomena. Besides, where is the plant that could be used in this way? 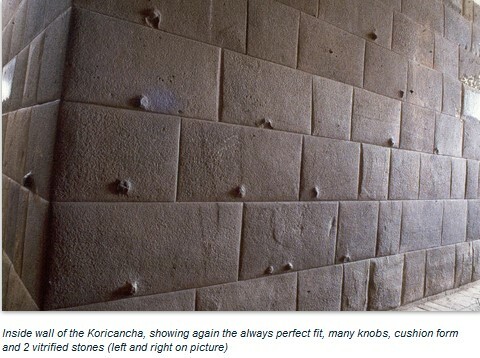 An extremely orthodox view is that the Inca had another sense of time; They, with endless patience and with thousands of people, would have transported the stones and then would have carved them to fit them so exactly. It seems to me that they had better things to do, and also that the scale of the vestiges is such, and the labour that was needed would have been so complex, that this seems highly unlikely. -The existence of ''vitrification'', a phenomenon in which the stone is very smooth and highly reflective. Alfredo Gamarra came to the conclusion that the 3 different styles matched 3 different periods. The first style is sacred for the styles thereafter. The first 2 construction styles were built in a time when gravity and density were less, and therefore, all materials could be worked on a grander scale with more ease and could then be more easily transported. The first style and period. Called by Alfredo the Hanan Pacha time, meaning Land of the Sky from Above, or the time of Paradise on Earth. This first style, with its corresponding monolithic building style, is seen as especially sacred all over the world. There was reason enough to build great monuments over it, such as the great pyramid of Egypt, which is built over the underground chamber, which is a typical example of this building style. Less gravity may explain how stone could have been modified. Even more striking examples of this architecture are the mountain on which Machu Picchu is built, the stone in the middle of the circles of Stonehenge, and the mountains on which the ruins of Pisac, Ollantaytambo, Chinchero and Sacsayhuaman are built. These examples show how certain areas of the rock come to the surface and were modified by this first culture in a characteristic way. ​Another fine example is the Rock of the Dome, the stone inside the mosque on the Temple Mount in Jerusalem, a sacred monument for Jews, Muslims and Christians. Nowadays it is a piece of rock on which all 3 religions make their claims, but the message of Alfredo is this: One world, one religion, because this stone is sacred, because it is from the beginning time of human history! Alfredo Gamarra said there was a 225 day calendar at this time, a calendar which was discovered on the Sun Gate in Tiahuanaco, near Lake Titicaca in Bolivia. So a time in which Earth was closer to the Sun, was smaller and therefore had less mass, resulting in less gravity. The second style and period. During the second period it was still possible to make use of the circumstances of lesser gravity; it was also easier to manipulate the stone, but not so much as during the first period. Characteristic of this time is the way that stones fit together perfectly, without the use of a bonding material such as cement between them. These stones can be very large, rectangular or polygonal. Examples can be found all over the world. Very impressive are the walls of Sacsayhuamán. I could personally see that in Peru the phenomenon of vitrification is related to this building style, as if the stone has undergone a molecular change. This is normally seen on the connection points. Also, other spots on some of the stones can be detected that underwent the same treatment, making it look as if an iron was used to mold the stone. At night, with artificial light, the reflective edges and other spots can be noticed, for example in the centre of Cusco.This style is often built very carefully around or over the first style. During this period, according to Alfredo Gamarra, there was an orbit of 260 days, a calendar equivalent with the Tzolkin calendar of the Maya. The third style and period. The third style is the simplest style. Small stones that were treated with a hammer and chisel, sometimes very precisely so as to seemingly mimic the 2nd style, but never as perfectly fitting. This was in in most cases the work of the Inca in Peru. They too had a lot of respect for the previous 2 styles, as they also built over or around those earlier styles. This is not an underestimation of what the Inca were capable of; they simply had not the technology to do the same. Alfredo Gamarra came to these interpretations as a result of dreams, literature review, research in the field, and study of the Quechua and Aymara languages, the ancient languages of the people living in and around Cusco. A subject mentioned also in Graham Hancock's book “The Fingerprints of the Gods” Alfredo explained how his research relates with the Bible, Atlantis and other lost and ancient cultures. The underlying idea of his theories is the division of the history of mankind in 3 periods, with lesser gravity on Earth during the 2 earlier periods. This comes back through his whole work, and it is what Jesús Gamarra and I decided to explore in the documentary “The Cosmogony of The Three Worlds”. Once having this vision clear for myself, I found more clues and evidence about a smaller Earth and less gravity in the past. This only strengthened Alfredo's story for me. The most obvious evidence is to be found within biology and geology. Biology: Megaflora and megafauna. Alfredo Gamarra claimed that the extinction of megaflora and -fauna was due to an increase in gravity. There are several authors who claim the same; a good example is the book by Stephen Hurrell called Dinosaurs and the Expanding Earth. In this book, the author demonstrates that the gigantic dimensions of, for example, dinosaurs, do not fit in our current world. They would collapse under their own weight; it is possible to calculate which dimensions dinosaur's legs should've had, just as you can calculate how thick the pillars of a bridge need to be to carry the weight of the bridge. The heart was also too small to be able to pump the blood around. The birds of that time had wings too large and too heavy to fly (wingspans over 10 metres). Hurrel also shows that there is a tendency from large to smaller in the course of the history of many animal and plant species. Geology: The Expanding Earth theory is another major theory that I came across during my search for more information. A geological theory that has existed for quite some time and that is experiencing a revival, thanks in part to authors like James Maxlow. Maxlow has presented a major work, called Terra Non Firma Earth.He makes it clear that an expanding Earth is hard to deny with all the evidence he presents. He proves that a smaller Earth used to exist, and that the entire “floating continents model” is wrong ( based on a Earth that through time had the same scale and mass). It is convincing to see how all the continents fit together, not on the Earth with the current dimensions, but on an Earth that is about 55% of the current diameter. According to Alfredo Gamarra, the Earth indeed underwent a process of growth, not as the Expanding Earth theory assumes (slowly and continually), but with changes of orbit, going from one orbit to the next, each time farther away from the sun, along with a mass increase and therefore an increase in gravitational force. The sun underwent a similar process, increasing in mass, so that in earlier orbits the force of the sun was relatively less, meaning that the effect of being closer to the sun was not so damaging for life on Earth as it would be today. According to Alfredo, humanity would have been living in the last three orbits (including the present one). He was able to identify the different periods with the different construction styles, differences in lifespans and sizes of people, with the last ice ages, and with different periods that are mentioned in sacred scripts like the Bible. Gods, Giants, psychic abilities and high ages can be related with gravity. Alfredo Gamarra indicated that humanity during earlier orbits had more abilities (such as telepathy and telekinesis), was bigger, and could live longer. Standard works such as “Human Devolution” and “Forbidden Archeology” by Michael Cremo point toward this same conclusion. What is the effect of gravity on aspects such as health, maximum lifespan and special abilities? One can imagine that gravity is something that pulls us down our entire life, which at the end makes us feel tired, and that at older ages we will be worn out, and our spine will become more curved. It seems that in space renewal of cells in our body practically stops, as research on Russian astronauts who stayed in space for months pointed out. At current gravitational force, our body renews all its cells every 6 months. It seems there is a limited, maximum number of times that our body cells can renew within one lifetime. This means that under lower gravitational force, the rate of cell renewal would be less, and man could live longer. Alfredo's first period corresponds to the time of the paradise on Earth; during this time man was (almost) immortal. During the 2nd period lifespan would have been over 1000 years, and during the 3rd period “His days shall be an hundred and twenty years '' - a division in 3 different periods by age, that we can find in the Bible. The existence of telepathy and other capabilities, ascribed to the gods from the myths and legends of many cultures, we can explain as follows: due to less gravity, everything was less dense in that time, so matter was easier to master by our thoughts. I agree with the principle that there exists a field in which everything is connected with everything, as described in the famous book by Lynne McTaggart, “The Field.” McTaggart proves the existence of this field; it is the universal force, which is also connected to the human spirit and thought. In this way, she explains telepathy as well as distance healing. Today, however, few people realize this principle due to the density of our existence, and apart from some very talented people, we only seem to realize this once we make use of methods like meditation, prayer, hypnosis, metaphysics or the use of drugs. This brings us back to Alfredo Gamarra. He claimed, for example, that by the change of orbit from the 2nd to the 3rd period, humanity lost its ability of telepathy and had to learn to talk. Before that time, we did not need to talk. It was the time of the Babylonian Confusion of Languages. Thinking in the way of McTaggart, it suddenly became for man much more difficult to make contact with the field because of an increased density by the increased gravitational force. I hope this gives a good overview of Alfredo Gamarra's ideas about how 3 different periods existed during human history and how this, according to him, relates with the presence of 3 different building styles in the Inca vestiges of Peru and several other places around the world. 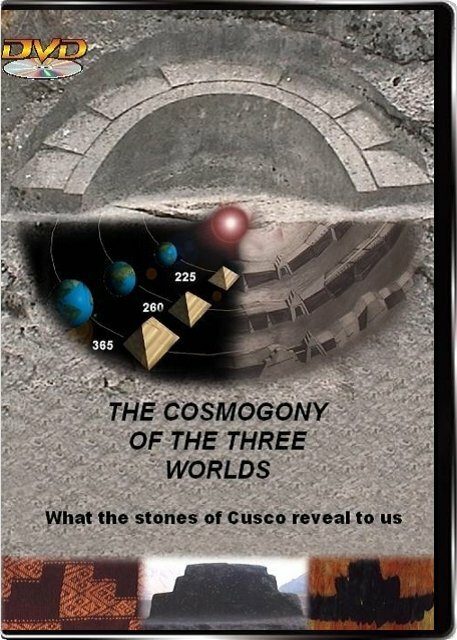 For more details on these ideas, see our DVD The Cosmogony of The Three Worlds, and the websites mentioned below. Erich von Däniken Chariots of the Gods? Jesús Gamarra and Jan Peter de Jong, Etemenanki, The Tower of Babel in Cusco, Peru?